← Will Hurricane Sandy Mean Business for PRofessional Solutions in July 2013? 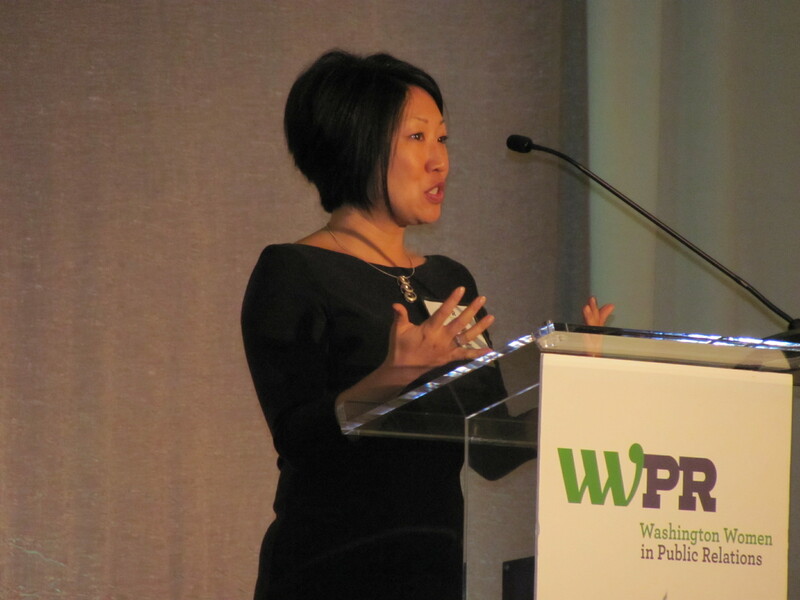 Congratulations to Stephenie Fu, 2012 Washington PR Woman of the Year! PRofessional Solutions, LLC and other members of The Boss Ladies were proud to be sponsors of the 23rd annual Washington Women in Public Relations (WWPR) Washington PR Woman of the Year awards program on November 15 at the Grand Hyatt Washington. Stephenie Fu, principal of SLF Strategies, pictured here giving her acceptance speech, was the recipient of this prestigious award. Fu, a former senior staff member at Ketchum, uses her communication skills to enhance the public’s health. Recently, she helped develop the USDA’s new MyPlate symbol to replace the former Food Pyramid and launched the campaign with First Lady Michelle Obama. The Washington PR Woman of the Year luncheon featured a keynote address by Charlotte Beers, former CEO of Ogilvy & Mather Worldwide and former Under Secretary for Public Diplomacy and Public Affairs at the State Department. After the luncheon, Beers was on hand to sign copies of her new book I’d Rather Be in Charge which gives women advice on how to advance their careers all the way to the C-suite, while establishing pride and power in the workplace. A raffle was held during the luncheon to benefit WWPR’s pro bono client, Thrive DC, a nonprofit working to end homelessness. This entry was posted in PRofessional Solutions News, WWPR and tagged Charlotte Beers, Stephenie Fu, Thrive DC, Washington Women in Public Relations, WWPR. Bookmark the permalink. 1 Response to Congratulations to Stephenie Fu, 2012 Washington PR Woman of the Year!